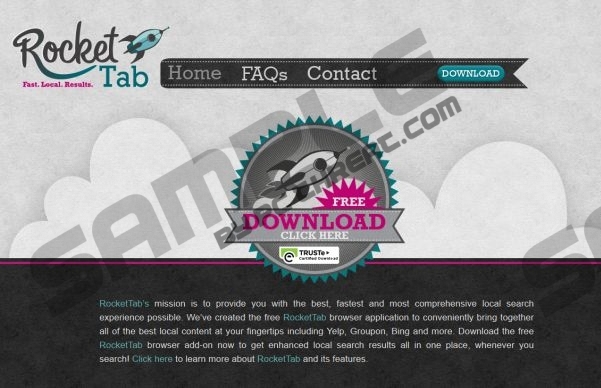 RocketTab is an adware application that might also be considered a browser extension. It is quite far from being a dangerous computer infection, and yet you are strongly recommended to remove RocketTab from your computer in case you have it installed. This application does not cause any dangerous to your system by itself, but it could be easily exploited by third parties to display malicious content, and that is something you have to take into consideration, when you take care of your system security. One of the main reasons why RocketTab cannot be considered a malicious infection is the fact that it has its own official home page which you can access at rockettab.com. There you can download the application, and you are provided with more in-depth information on the product, saying that RocketTab’s mission is to “provide you with the best, fastest and most comprehensive local search experience possible. So in a sense, RocketTab is supposed to be a browser plugin that enhances your web search experience. The question is though, whether it comes with any potential side effects. Considering that quite a few of computer security products classify RocketTab as adware, it surely is not as good as it might seem. Based on security research, once installed, the application adds its extension to Mozilla Firefox, Google Chrome and Internet Explorer browsers, and then it displays additional search results ATOP the general Google search results whenever you use the engine. It definitely still offers you the possibility to choose whether you want to use the information provided by RocketTab or not. However, you need to keep in mind that RocketTab is not classified as adware for nothing. For example, aside from the official website, it may also come bundled with freeware and other adware. It means that such programs often come in packs, and if you download something from unfamiliar third party file hosting web page, there is a high chance that you will install an awful lot unnecessary applications, especially if you choose not to change the installation settings. The main security concern related to RocketTab is indeed the additional search results it displays, because these results could get hacked and potentially dangerous content could be displayed. Where you to click on a corrupted link embedded in these search results, you might as well get redirected to a dangerous website that distributes malware. In order to prevent that, you need to uninstall RocketTab from your computer. Manual removal is really easy and you can do it following the instructions below. However, you should also run a full system scan with SpyHunter free scanner, because there might be other potentially unwanted programs installed on your PC, and it is never too late or too early to invest in a reliable antimalware tool. Open Uninstall a program and remove RocketTab. Click Uninstall a program and remove RocketTab. Select Add or remove programs and uninstall RocketTab. If you have any further questions regarding RocketTab or its removal, you can always leave a comment below. Quick & tested solution for RocketTab removal. Could i face any problem after uninstalling rockettab? so how can i remove rockettab!